We want to inspire you with our collection of furniture and fabrics. We want to create cosy environments with a lot of atmosphere and inspire you to decorate your home. The passion for fabrics has ever since the start in 1988 been a great source of inspiration. It can be the beautiful lustre of silk or the subtle colours in a classic flower print that makes one happy. We provide products for both a classic and a modern look with that special ABC touch. We design and produce everything ourselves and have a well established collaboration with wearers through out Europe since 17 years. Our fist product was the pile throw, it is made from the very best quality pile and comes in a wide range of combinations. These throws are always in style and have now become classic or as one of our clients put it; "a necessity in every mans home". First out in our line of furniture was the Emmachair, a classic beauty with nice legs. It is a traditional piece with roots from the 1830´s. We have now expanded our collection with a number of armchairs and sofas in a more modern design. Most of our furniture is small and easy to fit in a room. When you visit any of our dealers, you can choose which fabric you want on your furniture. ABC Collection wants to inspire you to a personal style. 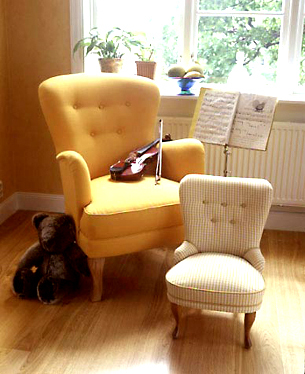 Alma armchair and Childrens Emma.